Adam Henrique currently plays for the New Jersey Devils in the NHL. He was selected by the New Jersey Devils in the third round, 82nd overall, in the 2008 NHL Entry Draft. In the first round of the Stanley Cup Playoffs Game 7 against Florida, Henrique scored 2 goals, 1 being the double overtime winner sending the Devils to the Conference Semifinals, becoming just the 2nd NHL rookie to score an overtime winning goal in a game seven. On May 25, 2012, Henrique scored 1:03 into overtime to eliminate the New York Rangers and send the Devils to the 2012 Stanley Cup Finals. This made him the first rookie to score two series-clinching overtime goals in the same playoffs. 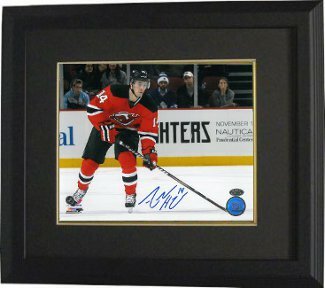 Adam Henrique has hand signed this New Jersey Devils 8x10 Photo. Leaf Authentics Hologram and Certificate of Authenticity from Athlon Sports. Custom Black Mat and Premium Black Frame as shown.